Sleeps 10 Gorgeous Tropical Falls into Plunge Pool/ Hot tub this Villa is Totally Outfitted for a Great Vacation! TROPICAL PARADISE HIDDEN AWAY FOR YOUR DISCOVERING VILLA JASMINE SOUTH PADRE ISLAND. Teak Wood, Leather, Tropical design, you'll definitely feel surrounded by the mood of the tropical. Lush tropical gardens that touch the sky stir the senses, bright Hibiscus and lush palms. Just steps for the soft sandy beaches of this unique and beautiful island. Just Steps from the most beautiful beach on the Gulf Coast So Much to do Water Parks Water sports, Sunning Shelling, Snorkeling, Live Music, Great Food and so much more. South Padre Island is now considered one of the top 10 beaches in the US. Scott grew up vacationing on the island as a child when there were only 2 resorts and simple shell roads. Jan, originally from California, was so delighted when in her early 20's she discovered that she had been missing out on this big beautiful beach. Not to mention, gorgeous sunrises and awesome bay side sunsets. She had always heard that Texas beaches were not as nice as California's beaches. What a wonderful surprise. Our warm beautiful gulf waters can be enjoyed by all. Scott and Jan are South Padre Island fans and plan to spend as much time as possible for many years on our fabulous little island. One of our favorite things to do at South Padre Island is to have a delicious gourmet home cooked fresh fish dinner on the upper deck by lantern light. To linger with friends, enjoy our favorite island drink, and chat late into the evening while watching the passers by on their way to or from the beach. We review the days activities and speculate what tomorrow, another day at the beach will bring. There is so much to do. At the north end you can visit the resident sea turtles and those who are just here for rehab to the southern end were we dolphin watch from children's beach. Anywhere in between we have gone sailing, surfing, skim boarding, boogie boarding, body surfing, shelling, diving off shore, para sailing, jet skiing, bay fishing, deep sea fishing, sight seeing on the bay at sunset, fireworks over the bay on Friday nights, cocktails, bayside at sunset, dining beach side and bay side, dancing to the live band at Pelican West or on the beach at "Wanna Wanna" to the Bongo Dogs, singing karaoke 365 days a yr. at the Coral Reef, crabbing, tanning, tiki torch parties on the beach at night, or just a nice long walk, bungee jumping, go cart riding, Schlitterbahn Beach Water Park, biking,(a favorite) kayaking, dune buggying, dog walking, kite boarding, just kiting, or simply take a book to the beach and relax beneath the umbrella with toes in the sand and going for a nice refreshing swim in the sparkling fresh blue-green water. The beach is one of the best places to embrace the local culture. It's were we watch the seabirds like the giant brown majestic pelican, and we do some good people watching, enjoying the breeze, being lulled by the crashing waves and the slower pace of island life. Note: hotel soaps are provided... IMPORTANT It is important to note that this is a self catered home please bring food and beverages and items you want to make sure and have during your vacation. Kitchen & bath soap, "extra" paper towel and tissues, paper plates, paper napkins solo cups etc. Make sure to bring electronic devices, music, and gaming, computers and video to TV cables are great and dvd movies. The Luxury Collection includes large beautifully appointed private residences outfitted with everything your group or family can think of for your memorable island vacation. Enjoy private pool and hot tubs in lush tropical gardens, gourmet kitchens, premium bedding and linens, bicycle, wagons, coolers the roll to the beach, great beach access, caretaker and maid service. Plus premium services, massage, wine tastings, beach party set-ups, Guided Fishing Tours and more available. Major Credit Cards sorry no Amex. Damage Protection Fee: $50.00 No $500 Cash Damage deposit! A non-refundable damage protection fee. The $50 damage protection fee protects guests for the first $500 of any accidental damage repair costs. Should costs exceed $500, the remaining balance will be charged to the guests. 25% of the Rental Fee is due with your Rental Agreement to reserve dates. 75% remaining balance is due 30 days prior to the check-in date and will be charge automatically to your card on file on or a few days after the due date. More About Vacation Villas of South Padre Island and Villa Jasmine. more. 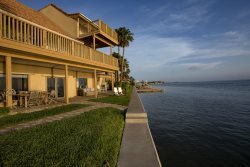 Vacation Villas of South Padre Island is truly a luxury Island experience! Our vacation home is eco-friendly. To be conscientious about the environment we do provide recycling bins that will be picked up on Thursdays. Please place all recyclables in the bin except for glass. Unfortunately, there is no glass recycling on the Island. Also, to be eco-friendly we use NEST thermostats. Nest thermostats are set at an eco-friendly temperature that allows for ecologically responsible vacationing in a nice cool vacation home at 70 +, degrees. We invite you to contribute to our efforts by being mindful of keeping doors and windows closed while using the AC system. Please do not try to cool the island. If you should require a cooler temperature we can set it up especially for you for an additional fee. Please inquire for details.